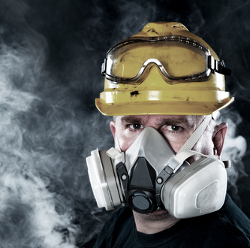 Many workers wear respirators or breathing apparatus (RPE) to protect their health in the workplace. There are a few different types of RPE and it should all be adequate and suitable. Adequate means it should be right for the hazard and it should reduce exposure to the level required to protect the wearer’s health. Suitable means it is right for the wearer, task and environment, such that the wearer can work freely and without additional risks due to the RPE. As RPE is a form of PPE, therefore the employer must supply RPE to whoever needs it in his workforce. Workers may also need to work in areas where oxygen levels are low, for example: confined spaces, such as a chamber or tank. RPE is designed to protect the wearer from these hazards. There are 2 main types of RPE, these are respirators and breathing apparatus. Respirators are filtering devices, they use filters to remove contaminants from the air being breathed in. They can be either non-powered, relying on the wearer’s breathing to draw air through the filter or they can be powered, using a motor to pass air through the filter. Breathing apparatus needs a supply of breathing-quality air from an independent source e.g. air cylinder or an air compressor. There are 2 main styles that the RPE comes in, tight-fitting facepieces (masks) and loose-fitting facepieces. Tight-fitting facepieces rely on having a good seal with the wearers face. A face fit test should be carried out to ensure the RPE can protect the wearer. Loose-fitting facepieces rely on enough clean air being provided to the wearer to prevent contaminant leaking in (only available as powered respirators or BA). Examples are hoods, helmets, visors, blouses and suits. Remember RPE should be the last resort. You can do a number of other things before RPE for controlling measures. When you think you could be: Breathing in contaminated air despite other controls in place (extraction systems) or when there is short-term or infrequent exposure and using other controls is impractical you will need to choose some form of RPE to protect you. To choose the correct RPE that will protect the wearer you will need a basic understanding of the hazardous substance and how much is in the air, the form of the substance (e.g. gas, particle, vapour), the type of work being carried out and any specific wearer requirements such as other PPE or a need for spectacles. If you are ever struggling to choose the right RPE for the task you’re doing, a quick visit to the HSE website would be a great help. If you are using RPE with tight-fitting facepieces you should make sure each wearer has a fit test. You can use the fit test as a training opportunity, as it allows you to highlight to the wearer the consequences of poor fit and improper use on the effectiveness of the RPE device. It is also good practice to have a system to ensure repeat fit testing is carried out on a regular basis. This is especially important when RPE is used frequently as a primary means of exposure control, e.g. annual testing for workers involved in licensed asbestos removal. If there are any changes to a person’s face through, for example, weight loss/gain, scars etc, a repeat fit test will be necessary.